I’ll Be There has been collecting dust on my shelf for over a year. I usually don’t buy books unless I intend to read them right away, but sometime between ordering Holly Goldberg Sloan’s debut and actually receiving it, I convinced myself it would be too emotionally draining. So I just left it on my shelf where it made me feel guilty every time I looked at it. And then last night, I finally picked it up. In the end, while I did tear up a couple of times, I’ll Be There came nowhere near making me feel all those things I expected it to. It is a modern fairy tale, and as such, it is based on extreme situations and characters, both good and bad. There are no gray areas at all, and this made it very hard for me to form an emotional connection. Sam and Riddle Border are being raised, and I use the term loosely, by a father who hears voices. He took them from their mother when they were both practically babies and has been dragging them around the country ever since. The younger, Riddle, has untreated asthma and seems to be mentally underdeveloped, and neither of them goes to school. Because, if you cared about something, it would be taken away. If you stood up for yourself, you would be beaten down. If you spoke out, you would be silenced. They had only learned how to be there for each other. Other people could never be part of the equation. Clarence had set up the rules of the game that way long ago. Emily Bell is just a normal girl with two normal parents and a normal younger brother. She is a senior in high school and a soccer player. There is nothing unusual about her life, until she meets Sam. When Sam and Emily meet, they immediately feel a connection and their lives inevitably become intertwined. But Sam’s father Clarence has different plans for his boys, plans that involve a forest and a shotgun, not teenage love and happiness. I am not used to third person omniscient narrator, not anymore. It is a narrative mode that was favored by Honorè de Balzac and Charles Dickens, for example, but that is rarely seen in newer (genre) fiction. Writing in this way, that allows the reader to see everything, but not to experience it through any of the character’s eyes, is not easy, and for Holly Goldberg Sloan, it was made even more difficult by the emotional complexity of her novel. And yet, she succeeded in offering insight into not just one or two, but almost every character in her book. Instead of getting overwhelmed by a very large number of characters, which would certainly have happened to a lesser author, Goldberg Sloan maintained all the narrative strings firmly in her grasp. 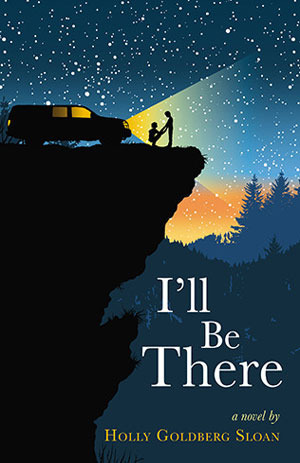 While the narrative voice certainly worked to her advantage in many ways, it also gave I’ll Be There a movie-like quality I didn’t really like. Combined with the naiveté of the plot, it somehow lessened the emotional value of the book. Goldberg Sloan’s writing gave me so much to admire, but the story itself didn’t exactly inspire awe. Some people never outgrow fairy tales and I truly wish I was one of them, but unfortunately, they hold no appeal for me. This particular (modern) fairy tale is more layered and insightful than most, but it’s a fairy tale nevertheless. As much as I’d like to believe it, people don’t usually get what they deserve, when they deserve it, and the good guys don’t always win against all odds. I find the idea slightly ridiculous, to be honest, having seen far more injustice than any person should see in a lifetime. I envy people who still believe in fairy tales, but I’m not one of them, which means this book just isn’t for me. Great review Maja! I haven't read this, but I think the fairytale aspect (and the no-grey-area thing!) would frustrate me as a reader - I like more realistic endings, even if they're not necessarily the "happy" ending you might expect. Great review Maja. I've never heard of this book before, but I'm sorry it didn't have the impact that you were expecting, leaving you disappointed in it. I don't think this would be a book for me either. I agree with Kit. Realistic endings usually work better for me than the typical HEA. Also, I'm not a huge fan of an omniscient third person narrative (I don't think I ever have been). Still, I'm glad to hear that the author made it work here, even if you failed to completely appreciate this book. Great review, Maja! Aww, I am sad this one didn't turn out quite like you were expecting. I admit, I love a good HEA, I am a sucker for them. I like to see people get what they deserve (good or bad!). I can see why that wouldn't appeal to some people. Sorry this one wasn't better for you. I've gotten truly terrible about buying books and letting them gather dust. Oh, there are some I read immediately but I don't know what happened to me! This book got some good press but I'm not sure it's for me. I do like fairy tales but...meh. It just doesn't get me excited. Maja, I love fairy tales but only when they're set in fantasy worlds or they're re-tellings. In contemporary situations, not so much. I want my contemporaries dealing with gray areas and not being black and white. So, I'll pass on this one. Great review as always though! Reading the description of the book and some of the things you said about it, it does sound very emotional. I get what you're saying, but I'm still really curious about it. Wonderful review, Maja! I seriously love your way with word. I had no idea this was a fairy tale re-telling, but I have always wanted to read it, mostly due to the cover and a couple of positive reviews. The family issues still make me want to read it but I am a bit hesitant now. Oh how disappointing! I had high hopes for this one. It does sound like the writing is impressive, but I just don’t like the sound of the fairy tale HEA and the 3rd person omniscient (this always makes it so hard for me to get fully absorbed into a story). Maybe I’ll wait to see what Holly writes next instead of picking this one up. Lovely review, in any case! Great review Maja. I've been interested in this for a while, but I don't think it's one I'll read for a little while and when I do start it I think I'll lower my expectations.